Located on the outskirts of Chartres, 1.9 miles (3 km) from the city center, the hotelF1 Chartres offers quick access to the area's finest tourist attractions: the cathedral, chateaux, parks and the gardens on the banks of the Eure River. Discover our Side-Car, Tandem and Cabrio rooms at budget prices with free WIFI and unlimited breakfast. Discover our new "#ontheroad" concept in our newly renovated hotel! I thought that the room was too small! And there wasn't even one chair to sit on! I felt that everything was just too compact! No towels provided, you had to buy one at reception. I have never had to do this ever in a European hotel !! See above,do I need say more. Very clean and tidy. I booked an ensuite room and was dissapointed to find I had to buy a towel from reception if I wanted to use the facilities. This is the first hotel I've stayed in where towels were not supplied. We booked a renovated F1 after a long gap and were extremely unimpressed. It might have a bathroom en suite, but you would be stuck if you were fat ...i have seen bigger airline facilities. Absolutely minute...no cups , NO TOWELS.....you could have told us that when we booked!! Decor was trite pseudo travel posters ....boring beige would have been preferable....and the breakfast was very basic ...I’m glad we only booked one, there wasn’t anything I wanted. There was no obviously dedictaed parking.....and the hotel was not easy to find. All in all, we will not be using F1 again. I found the room in the hotel to be small. Would not have wanted to stay more than one night. I have a disabled wife and need more trips to and from the car than most people. I found it frustrating that my code did not work on the entry door at 11.30 in the morning after our nights stay. Jean-Marie, however, was most helpful and made the situation for us easy. A real gentleman. Upgrade to the hotel from 2 years ago was a marked improvement. Room design without the overhead bunk and separate table with 2 chairs much more comfortable as was the better mattress with duvet. Would have liked a firmer pillow. Highly impressed with the new decor. I shared a room with shower and toilet with my sister: very clean, comfortable bed, good to have private facilities. Two of us (both) pulling trailers arrived on a vert busy Friday night. We were helped to find parking and made very welcome. Rooms are basic but clean and the beds comfortable. Breakfast was basic, plentiful and good. An F1 sign outside would make it easier to find. Great. Breakfast is cheap but poor. Stay was excellent, particularly the hotel manager. First time I've tried the breakfast. Very poor. How much does real orange juice cost? It's really cheap in the supermarket. Made whole breakfast feel chemicalised. A newly refurbished F1 in a good location. 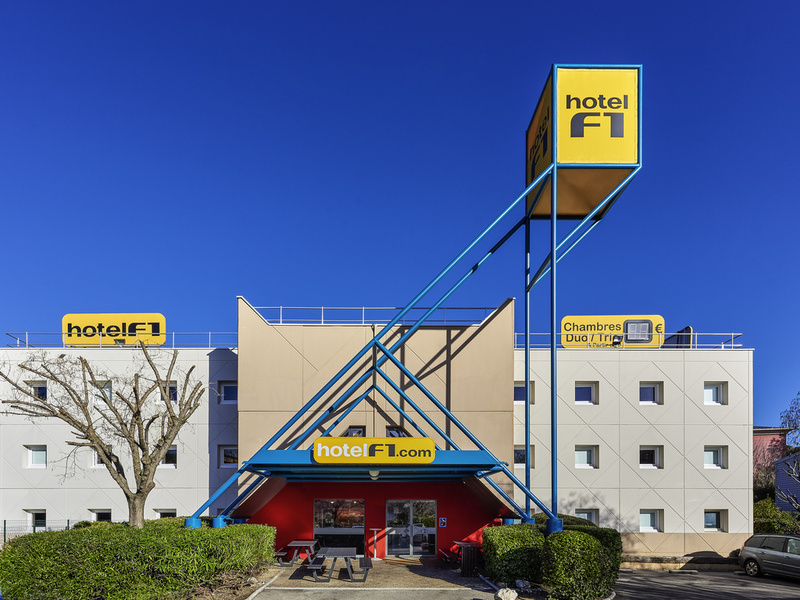 Stayed here many times, it’s a good clean and recently refurbished hotel that now offers even better value for money following the traditional F1 principles of low cost for reasonable quality at the low end of the hotel spectrum. But it works and is excellent value for money.